It’s amazing what you can learn watching the Olympics. Michael Phelps’ drive towards eight gold medals has been a veritable life lesson for us all. Sunday night we were all reminded that even great people in great pursuits need others to help them succeed. Phelps’ 4 x 100 meter freestyle relay teammate Jason Lezak kept Phelps’ dream alive when he improbably overcame a huge deficit against the world’s top 100-meter freestyler. Friday night Phelps was aiming for gold medal #7 – the one that would tie Mark Spitz’s single Olympics record – and again the life lessons flowed. Phelps was favored in the 100-meter butterfly, but after so many swims he has to be feeling it. At the 50 meter turn, Phelps found himself in seventh place out of eight swimmers. Serbian swimmer Milorad Cavic – Phelps’ leading competitor in the race – had the lead and appeared poised to upset Phelps and deny history. The race seemed to belong to Cavic with 10 meters remaining. As they approached the wall, Cavic glided and Phelps pushed forward with one last stroke. He touched the wall 1/100th of a second ahead of Cavic. So? It’s just another swimming race, right? Yes, but there was a lesson in there. We live in a culture where we are constantly comparing ourselves to others. Women compare their figures with models and movie stars in magazines and magazines encourage it. We compare our cars with our neighbor’s car. We compare our results with others. There is almost never a time we are not comparing something about us or our lives with someone else. Comparing robs us of energy and can sidetrack us. We start worrying about what is fair. This thinking is counterproductive in pursuing our goals. We are here to run our own race, not worry about the race others are running. Who knows what was really going through Cavic’s mind as he neared the wall. Perhaps he was gliding because he thought he had victory. 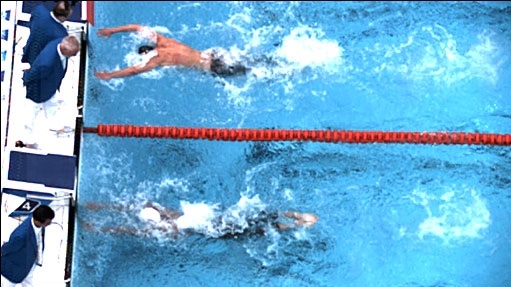 Meanwhile, Phelps was just running (um swimming) his race. When we run our race we put the blinders on and forget about the medals, the credit, the fame, or the financial reward we may be seeking. Those things will sort themselves out later. During the race we are all about the race and pushing towards that wall. Whether you are a sales professional or a writer; an athlete or a student; a scientist or a clerk you must run your own race and – this is critical – allow others the run theirs. Focus your energy. Be all about the race. Never assume you have it until you touch that wall. That’s what Michael Phelps did. You may not win every time, but your success will be far greater than if you are constantly looking around to see where others are in comparison.